sunshine and whimsy. : summer fun. Go to Xi'an: We actually went to Xi'an this past weekend! (I promise we made the list before we went ;) I'll hopefully have a post up about our trip sometime soon, but you can check what I posted on Instagram here. Eat ice cream at Dari Delite: Yup, has to be spelled that way. You can read about my fave childhood ice cream spot at the bottom of this post. Visit Nemy & Tiff & baby Una: Tony's best friend (who was his best man at our wedding) and his wife just had a baby! Luckily they'll be in Canada the same time we are so we're hoping we'll get to see them! Eat lobster: I've loved lobster since my first visit to PEI just a few years ago, and Tony fell in love with it on his first trip to Canada. He asked that this be added to our summer fun list and who am I to say no? Celebrate our first anniversary: I can't believe we've almost been married a year! It's flown by! So excited to celebrate with T! Drink Tim Hortons: Of course. Eat a donut: This was one of Tony's and I was surprised! But hey, I can eat a donut! Go to the Fredericton Boyce Farmers Market: A Fredericton must. We're supposed to land in Fredericton on a Friday night and you better believe that we'll be at the market the next day. Eat a bbq'd hot dog: A summer must. Nostalgia in food form. Drink local beer: Pump House Blueberry Ale, Picaroons Melon Head, Moosehead Radler. I'm comin' for ya. Walk across the World's Longest Covered Bridge: Simple but fun. Go to Paint the Heartland: I've been attending this art festival for years, and I've even worked at it! It's a favourite event every summer and luckily I'll be home just in time for it this summer. Drive on a country road with the windows down & the music turned up loud: Because the feeling it gives me is this. Read at least 5 books: I've already read 2 since school ended, not including the two I had begun while school was still in session. Maybe I should increase this goal. See my book reports here. Visit the library: Did you know I worked at a library for three summers while I was in university? I was the Summer Reading Club coordinator and I've loved libraries ever since. Hug my family: A given, but one I'm really looking forward to. 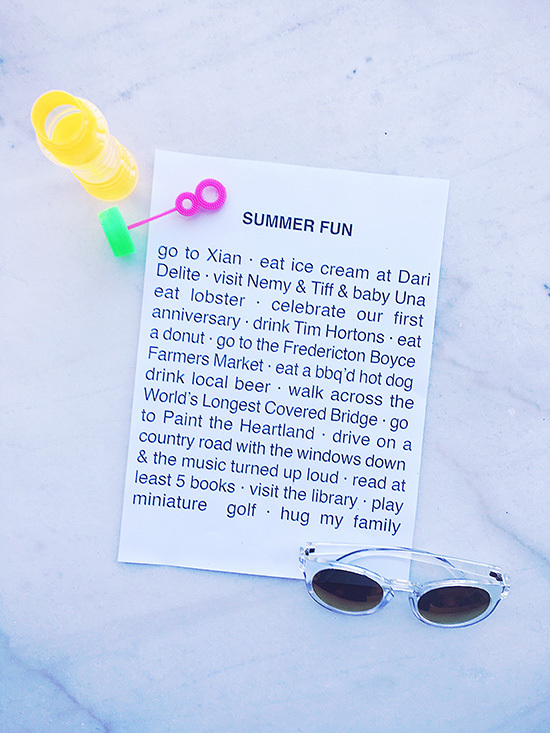 What are you doing this summer for fun?